Before determining your grocery budget it’s important to know what your current situation is costing you. Most often my question goes unanswered or I get a response of “I don’t know” because for some consumers grocery shopping is simply buying food for the week and paying the bill. Unfortunately budgeting and frugality are not normally part of the shopping trip until it becomes necessary for some people. Don’t make this be you. A food budget should be essential for everyone unless you have unlimited income where money is of no object to you. Not many of us reading the blog are that fortunate I’m afraid. Typical grocery costs per month will differ from person to person depending on many factors such as size of the family, income level, health and special diets and so on. You can read all about that in the post I linked above. Currently it’s high-season for budgets now that new year has arrived and people want to get back on track financially or they’ve set goals for the year to pay off debt. The blog is busting with people looking for answers about food costs and budgeting which happens every year. Although I do my best to answer every email or message I get sometimes it’s easier to just write about what the majority of readers are asking me. I do my best to explain how we budget and what we did to arrive at our current numbers so the readers will have some sort of benchmark idea of what to do. I’m not saying our way is perfect but it has worked for us and contributed to helping us pay off our mortgage in 5 years. A typical months grocery expenses for our household is $235 for 2 people and a toddler plus a $25 stockpile budget. Although this may seem like a tight budget to you remember it depends on many factors all of which should pertain to your situation. Even then this years budget may not work for us with price increases across the board which means we will have to review our situation before it gets out of hand. Before you can start any type of grocery budget I’m going to share with you a few things you should do in order to be a successful shopper. How did we come up with our grocery budget? 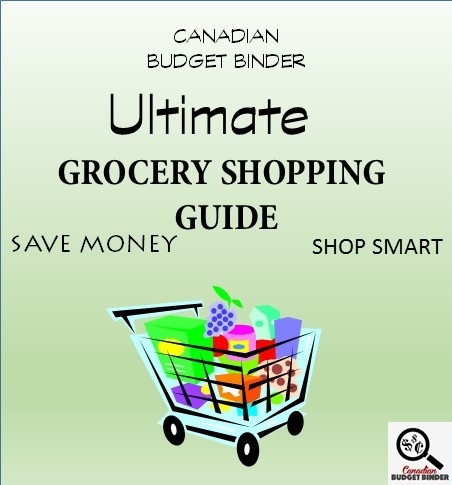 Over the years we have learned so much about grocery budgets and shopping in general that I wonder why more people don’t invest a bit more time learning how to save more money on groceries. With the prices of groceries slated to go up this year many of you have told me that it’s time to buckle down and get serious with your grocery budget. If you don’t know what you are currently spending at the grocery store every month the first thing you need to do is document. We did this and realized we were spending far too much money on food even though we thought we were saving money using coupons. Even if you are on a fixed income you need to know how much money you can spend freely without going into debt. No one wants to create debt buying food or even pay interest on a credit card because you are spending more than you can afford. Take a month to document everything you buy at the grocery store on a typical shop without thinking about money unless you already have a set amount to spend. You might not even know if that amount is enough money but you will know when you’ve done these exercises. Keep in mind the monthly food total that you get will be an average grocery cost because there may be some months that you spend more money to buy those one-off items. You know when you run out of ketchup or horseradish. Stuff like that. Typing out your weekly grocery shop and reviewing what you are buying including the prices will give you a estimate of just how much your monthly grocery costs are. You may or may not be shocked by this number but if you are shocked it’s imperative that you get on a grocery budget that works in your favour. I’ve chatted to many fans over the years who said they couldn’t believe they were spending $1200 a month on groceries for their small family. One reader even wrote a blog post for CBB to share just how she cut her grocery budget from $1100 a month to $600 in just 6 months. This post is very popular which leads me to believe that many people are struggling with their expenses and want to learn how to make changes. This is good news. This is what we did to figure out just how much money we needed to save each month for food after we got paid. You can’t complain about the cost of food if you aren’t budgeting or at least know the exact amount you can spend on monthly food costs. If you just go to the grocery store and spend money and complain that you aren’t buying much maybe you should review the way you grocery shop and how to get more out of your money. 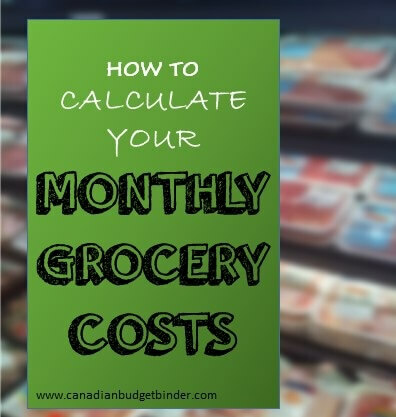 Once you find out how much your monthly grocery costs are you need to figure out if you should add more to your grocery budget allowance or spend less. Typically I would track expenses for 2-3 months to get the best idea but if you are time-strapped then one month will do. If you can pull off a year of documenting your monthly grocery costs you will have an even better number for the start of the year. Even then, prices change so it’s just an estimate but certainly a number that’s worth it’s weigh in gold when it comes to you financial health. 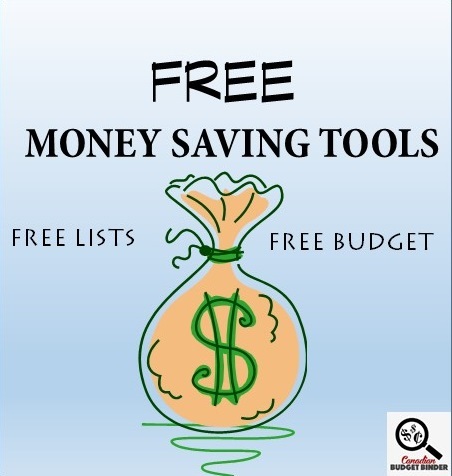 If you have no idea what your monthly grocery allowance is because you don’t budget I would suggest downloading my free budget or finding a budget that works for you. It takes no time at all to fill in a budget which will give you numbers that will change your financial life if you stick with it. By now you should know how much you can afford to spend at the grocery store. If you found that you were spending too much money on groceries during your one month of documenting monthly grocery costs I would recommend that you continue to document your shops. Posting your shops in the grocery game challenge is a great way to see how much you are spending, interact with a team of savers and potentially win a PC Gift Card to cut down on food expenses on your next shop. Alternatively just track what you are buying at home just so you know. Not knowing is like pulling the covers over your budget and telling it to do what it wants. That always ends bad or costs you money you could have saved towards retirement or to put towards your education, debt or other life goals. If you only want to find out how much money you’re spending on food every month all you need to do is document what you are spending on food. It’s that easy. Some people like to split their grocery category into a few categories like Food, Pet, Health and Beauty and Cleaning supplies. The reason behind this is so they can track just how much they are spending in each category to give them a more accurate number. This is what we chose to do a couple of years back and it has worked out great for us. So before you do a search online about how much you think your grocery budget should be realize that the only way you are going to find out is by doing research on your own spending habits and by using a budget. Even trying to estimate or use budget costs that other families use will never work. Every situation is different. It’s true that it’s easier to say that food is costing you more money and you just keep on paying for it but when you realize just how much you can save you’ll never turn back. If you don’t care, you wouldn’t be here right now so don’t click x and leave, read my Ultimate Grocery Guide and start saving money today. How did you first find out how much you were really spending on groceries before you started to use a budget? We spent quite a bit this shop and it was because we went into Zehrs and were hit with pink stickers everywhere. The deals were too good to pass up especially that salami which was reg $5.99 each. It tastes so good and it’s great for lunches. With limited money left for the month we will have to get creative. We will need to buy milk which will eat up at least $17.94 of $49.95 and the rest will strictly go to veg and fruit. We can do this!! Although we had a grocery list we failed this shop terribly because of in-store sales. Just look at the in-store discount already for the first month of the year. If you buy chicken from Flamingo that $5 coupon is sweet!! The chicken goes on sale regularly so may even score a freebie. Yep that is the weekly sale with those bonus points!!!!! Neddless to say I bought lots and got a rain cheque or two. The hubby and his siblings take turns hosting so my fil doesn’t have to do it anymore. There was no csm working the day I was there shopping and was refused by my cashier and the one he asked behind him because they don’t have a customer service desk they have to do it at the till. So when I called it was another day to talk to the csm about what happened she told me because it was no longer the same day they could not redo the transaction. Normally I would have fought it but I am tired and didn’t wanna waste another drive over there. We got a dzn doughnuts for $2 and I think they were called annettes at rcss and they were okay especially for that price. $3.49×3-$1Cx3 athentikos yogurt -50 AM!!! I had coupons for this but the cashier refused to take them because I had already been rung through the till. I called am spoke with the cashier supervisor as what their policy is and the cashier was wrong and should have refunded my cheese and rerung them threw with the coupons and she was gonna retrain him but unfortunately I was sol on being able to use them this time. You live and learn I guess. Really over this week!! But we are only half way through the month and can balance it out. I also wanted to stock up on my staples of cheese and alfredo sauce which will save us in the long run. The lasagna I couldn’t make for that price and we don’t mind the PC frozen version. It’s alright, so we picked up one. And the amooza twists are a handy healthy snack item for on the run to hockey, so I have already told hubby it’s for the kiddo only. That way it will last. My kiddo loves the instant chicken soup, we buy the lower salt version, and I don’t mind having it around when it’s a great price. That makes lunches easier. We do make most of our soups homemade and he eats it too, so instant is great for convenience and a happier kid. He likes the variety and never complains about the homemade. I don’t think I’m doing him any harm, especially with the lower salt version. He still gets a better balanced diet than I do. I eat way too much of the cheaper stuff because it helps us stay on budget (pastas, carbs, baked goods). Not as good for me, but fresh is so expensive right now, I am making sure he gets the proper nutrition because he is still growing. It’s only my waistline growing, and I know once I get to work more than 8 hours a week, that will change. Yes, I took a part-time job during my last semester of school. As if I wasn’t busy enough, but it’s essential to stay on budget and hubby takes a hit every Jan, Feb and Mar. So, yay, the student job is related in my field I am studying for, so I’m looking at it as a win, win. I’m just tired, lol! The job couldn’t have come at a better time. In some cases, I’m having moderation issues same as hubby. We both have a lot to work on. Everyone has their weaknesses! The lasagna was for the 1 kg size. It was two large pieces each and one third the size of the massive one I usually make which costs me easily $30 now. So, it was delicious! •	Weekly Overview :Sorry about being so late with this post… has been that kind of week. I am really happy with the free wine glasses I received for the filled booklet of stamps this week. So far I redeemed 2 booklets. I received 41 airmiles. That’s great that you picked up some free wine glasses! I see you buy organic. Is this something you always do? Have you ever made Hummus before? You can buy everything you need for cheap and make it at home over and over again. It’s worth it! I have the recipe on my blog. 🙂 You have such a variety of foods in your shop. I like it!!! I guess it’s smart to load up on butter while it’s cheap. Is it Safeway that gives you the stamps? That’s great for Air Miles. We always struggle to collect those I’m afraid. What are your secrets? You get ballot 22 Mr.CBB. Keep up the great work. Safeway gives the stamps for the glasses, and I hope to get another two before the deal is over. They are beautiful and great quality. Last year their deal was Henkel knives, I LOVED that deal. Safeway also has great airmile deals, but maybe that is just out west. I have made homemade hummus but I don’t like the texture, maybe it is my blender? I usually spend $600 to $800 a month on groceries because I love buying organic, and was always tempted by treats. But I found I also wasted alot, and bought too many premade foods (like hummus LOL). So that is why I am taking the challenge. I want to see if this is doable. Wish me luck! Weekly Overview (your final thoughts) a number of small shops and some deals. The frozen meat pies were a good sale and hubby and the boys love them. Jackson’s has been having sales on things I use for body wash so it’s a low stock up. I still have lots of room left to work with but I still need to be careful as Feb. is a 5 week month, just the way things went. All in all a decent start to the year. Sorry, yes AM is Air Miles. As of last April Foodland started taking them for the miles. I have my card on a 50/50 split between the miles and what they call dream cash. Ninety five cash points can get me $10.00 off my groceries, I used it last year to help at the end of the year to help come in on target. I think Sobeys takes them as well. Because of this I get regular emails with offers to load on my card much like Shoppers or PC Plus send out. I load them up and some are discounts and some are for extra miles if I spend a certain amount. Very common is spend $35.00 and get 10 miles over what I normally get. Usually a mile for $20.00 spent. Every little bit helps. I am hoping to save up those cash miles for next Christmas shopping. Jackson’s is the local Guardian drug store and I have a loyalty card there too. Works much like the Shoppers card but I don’t need a specific amount to cash out. We get most of hubby’s meds there but I don’t get points for those, just everything else. The cranberries are in the freezer to use later for baking and sauce. Thanksgiving until about Christmas is the only time I can get the fresh berries so I grab and freeze while I can. Originally my budget for groceries was $360 ( i.e. $90 per week). Then I thought I could try for $320/month (i.e. $80 per week). As I sit here now I wonder how $46.29 are supposed to get me to months’ end – not even thinking about $6.29. February will be a new chance to aim for the lower budget. The good thing is that this shop was a lot of stocking up and I was able to pre cook so much, that it will take me to next weekend and beyond. The ground beef and tomato/pasta sauce has become delicious meatballs. The Minute Rice Cups are now in my drawer at work for simple and fast microwaving. The reduced Kaiser Buns will become bread pudding over the weekend (also freezes well). The Chicken will be used with Broccoli and Carrots and frozen Peas for Butter Chicken. I’ll be baking a bread again and an apple cake. My freezer and pantry is full, so a no shop week from Jan 18-25 (other than milk maybe) is definitely doable. I will do my best to stay away from stores – I suppose that’s the only way to really save and stay within budget). no, those fruit cups from Walmart turned out to be too expensive and a complete luxury. They went on sale at Metro three days later for a dollar less each. UGH! I am going to scratch them from my list going forward. They take up way too much of my budget for little to no nutritional value! And yes! I have a No Frills close by and will pick up some canned mandarins there if I can’t live without them at all. My bread pudding is really easy and I eyeball the ingredients usually. But if you like I am happy to write up the recipe and take a pic for your post. The German Apple Cake is really easy as well and I am happy to share it. It’s based on an online recipe, but I have made a few changes to it. Next time I make it, I’ll make sure to take a picture and write up the recipe. It turns out staying away from the stores is really hard – especially when I have a handful coupons that are about to expire. I have to admit that I completely went over budget this weekend – right after vowing not to go shopping again – and spent the next 3 months of my Beauty/Household/Cleaning Budget. But everything again was on sale, with 32$ worth of coupons, my first SCOP success and extra shoppers points/miles. Oh well… There is always room for improvement. This week will be a no shop week – I can at least aim for it. My freezer is way too full anyway. As I am going on vacation in February for 10 days and wont be using my grocery budget while away, things will balance out overall, so I am not giving myself too much pressure for going over budget. It’s a work in progress. We all go over from time to time. I went shopping on Sunday and I’m over as well but I’ll make that up the following week. The fact that most of the items were on sale is quite accomplishment. I know that my shops are about 1/2 or less of sale items….but then I’m also a work in progress. Thanks for the recipe and the awesome conversion chart Mary. Thanks for your shop and welcome back to the GGC. Do you use any coupon apps at all? How many people does your shop feed and do you give yourself a weekly budget to spend or just the monthly budget? If you are able to use brands so we know how to compare prices that would be great. ex: No name Ketchup, Heinz Ketchup. Hi everyone. This is my haul for the week. $1.25 Koop Dijon mustard 375 ml. So this is my shop this week. I didn’t need a whole lot and there were not many great bargains so I came in under budget again this week. I wouldn’t say that you failed because you were over budget this week Mr.CBB. You were able to snag some real bargains that will help you out later on in the year like the salami. Awesome deal! You also have a plan to deal with shortfall for the rest of the month. While I was shopping this week I was surprised to see that the tofu I bought at Food Basics last week for $1.15 is only $1.00 at Walmart. May have to check out Walmart’s other prices more seriously! I’ve always tended to shy away from Walmart because of the crowds and stocking problems but maybe it’s worth another look. Thanks to whoever posted about the 3 litre milk at Shoppers. I hadn’t noticed. I have been trying to do what Mary suggests and use up food I have so as not to waste and overspend. That’s why my shops have been relatively small the last few weeks. Will comment separately on Mary’s post. Yeah I love the pink stickers too but I am also wary of them because I can easily overspend and buy products that I don’t really need or can’t use before the product goes bad. For example, yesterday my daughter dissuaded me from picking up a great looking cheese tray that had a pink sticker on it or I might have bought it and overspent for the week on something that wouldn’t have helped me in the long run. I’m a sucker for bargains so I avoid some of the temptation by not shopping on Mondays. My kids all live with me or maybe I’m getting old enough to start conditioning them into thinking I live with them and they need to practice taking care of me so it won’t be so much of a shock later on when I need them too. 🙂 Unfortunately with all the different schedules and food preferences sharing meals doesn’t always work out so everyone buys/cooks their own food although there are lots of time everyone will contribute ingredients or share what they’ve made. This means that when I split food with them it is a physical/financial split. They take a portion of the product and pay for that portion.I know it sound horribly and unnecessarily complicated but it didn’t seem that any of the other ways we tried worked very satisfactorily either so this was the lesser of the evils. With regard to meal plans, sad to say I’m not much of a planner. I don’t usually plan much more that a day or two ahead. I go through the fridge, freezer, and pantry periodically to see what needs to be used up and take it from there. I certainly do see the advantages to planning for the whole week haven’t been able to make it work so far because I like flexibility. That being said I think you’ve inspired me to set a new goal this year is to start making weekly meal plans with some flexibility built in. Anyone got ideas? This is what I ate today and plan to have tomorrow. What a wonderful idea to split food products with your son and daughter. I am sure that allows you a lot more variety than if you had to pay the full shot. We just got a Walmart here in town so I plan to add their flyer to my list of flyers to check each week. A few pennies savings here, a few pennies there…it all adds up! Splitting food with my kids really helps provide variety as you pointed out. It also allows me to take advantage of buying in quantity to save money too. Everything helps. Just curious, what’s in the Swedish Split Pea Soup and how long does it take to cook in the slow cooker? This week our shopping is about “the absolute basics” that I need… no extras. I have a lot of soup leftovers in the fridges…Peasant Cabbage and Tomato, Chicken Vegetable with Nugget Potatoes and a creamy Yellow Split Pea with Ham. I had my grocery list and meal plan all made up then – I did something that I have started to do in 2016. I went to the fridge to see what I have to use up FIRST! Hmmm. The list shrank from about 30 items to 4! Well there’s an easy budget saver folks!! 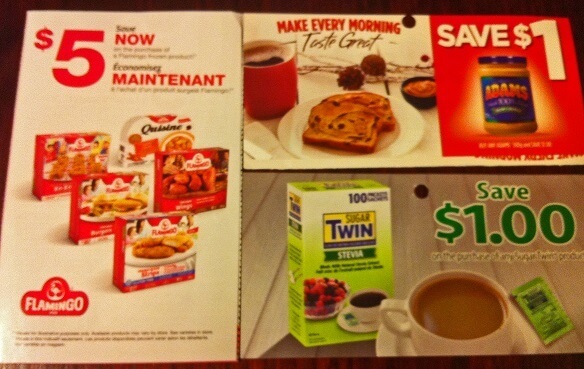 I, like many of us, read the online sales flyers and mark down the “terrific sales” on a grocery list. Then I get all excited about the “deals” & try to build a meal plan around the sales. BUT, I wasn’t looking at was how much do I really NEED this week…for only this 7 day period. Will I survive without it? Can I stretch what I already have into a tasty, healthy plan for the week? If not, what do I need to make that happen? It’s easy to find another sale, maybe not next week but certainly within the next 6-8 weeks. On the other hand, it’s hard to put the money back into my pocket once it has been spent. Have you noticed I REALLY like to hang onto our pennies?? Ha ha ha. I am slated to make another batch of the Chicken-Mushroom-Onion with Dill Soup that we have fallen in love with and for a treat we’ll also be enjoying a pot of Velveeta Cheesy Broccoli Soup. Five soups in rotation will warm and fill all the tummies at our house! We have about 1.5 loaves of our homemade Cottage Cheese Dill bread left, a whole loaf of the Christmas Banana Bread and I plan to bake a Quick Peppery Cheese bread & Apple Cornbread this weekend. If I don’t run out of steam, some muffins may get added into the mix as well but we shall see. I could make either Pumpkin Spice muffins, Banana-Pineapple-Coconut muffins, Mincemeat Muffins or Applesauce Raisin and Walnut muffins with the supplies I have on hand. Obviously, I am not saying that I don’t stockpile – I do! But, I only have 2 items currently on my “Watch For Sales” list… 28 oz canned Diced No Salt Tomatoes and rice noodles. For me, if I decide I want to make a dish, I can add my missing ingredients to the “Watch For Sales” list and WAIT (there’s that darned delayed gratification cropping up again)… until I can get what I need at a good price. Then, and only then, I add that dish to my meal plan rotation. I am absolutely committed to ZERO WASTE this year. I can’t afford to just burn money putting food out in the trash. Can you? How about you? Do you NEED everything on your list? Or are you like me and have to watch that you don’t get drawn into the lure of a sale? Maybe it’s those pretty pink stickers on the discounted merchandise weaving a spell on you? Remember… a pink sticker is only a deal if you actually NEED that item and it was on your list BEFORE you walked through the doors of the grocery store. Failing that, for every pink sticker item that’s not on my original list that I add to our cart, I remove a similarly priced item off of my original grocery list. It keeps the weekly spending in check and I don’t have to miss an item that is normally an unaffordable treat for us. Win-Win I’d say! OUR CURRENT TOTAL UNUSED RESERVES ARE $973.86. This means the $936.51 that we carried forward from 2015 PLUS AN ADDITIONAL $90.00 that we have added in 2016 LESS $52.65 that we have drawn out for use in 2016. I know for myself, I look at Reebee and tag the items that I would like to get but don’t seriously look at them until I’ve made my supper meal list. I start with what we need to accomplish those meals plus milk and then do I look at the other things that I’ve tagged. Since my decrease in my bi-weekly purchases, I have to fairly strict on what I’m purchasing. The Christmas Banana Bread was a recipe I found online BUT as with all recipes, I see it only as a suggestion so I lightened it up & changed what went into it for a gluten free diet and based on the Christmas supplies that I had on hand. Next time, hubby wants double the amount of maraschino cherries and I may also throw in some candied citrus as well. Overview: This week was stocking up on the cat supplies. We are still living off the freezer and pantry with little additions being made to for current and future meals. This is the year that my debt is going to be my top priority to vanish. I’m also looking at some items that I can stock-up on now, while I can get a decent price for it. At the end of last year, I was looking at my Cleaning Supplies and “Beauty Products” and looked how much we purchased over the course of the year. So if I can find a good price on some of those items, I’m going to stock up (maybe the full year’s worth) so that they are on hand. As far as groceries, the “must-haves” to stock up on are tuna, cheese, bread (if I have freezer space), meat, etc. Just like with this shop, I stocked up on the cat supplies, which should last them anywhere from a couple months to 6 months. So yes, my budget takes a hit now while I have the funds but that will be made up and be back on track by year-end. If you pay with credit card many budgeting software will automatically compile your spending into the groceries category and give you a good estimate based on previous spending, so you don’t have to go dig through receipts. Another way to go without receipts would be to have a cash envelope with grocery money and see how much is left by the end of the month. I stopped tracking but my shops are pretty much always the same so no surprises. Hi, I am Lori and I am addicted to grocery shopping!! Ha Ha! Before starting this challenge I now realize I went to the grocery store almost everyday. As soon as we would run out of something I went to the store and picked up that item along with whatever else I found on special or marked down. After going over budget last week I was not able to go to the grocery store again that week, so I believe that this is not only going to help my budget but also my time management as I now have more time to get things done. It’s a WIN-WIN! I bought the Pepsi as it was on special and there was a coupon, if you buy $20 of Pepsi products you get $20 back in free coupons.